Maravilla Oceanfront Condo Suite 2302, highly recommended! Oceanfront Condo! Look at that View! I can see for miles and miles! Welcome to the 'Elizabeth Claire Condo,' suite 2302, in Maravilla Resort in Destin, FL! Treat your family to this absolutely beautiful 2 bedroom, 2 bath OCEANFRONT condo for a Dream Vacation on the Emerald Coast! Breathtaking views! Gorgeous Sunsets! Amenities: 3 Flat screen TVs with cable, DVDs, King size bed, Queen size bed, Queen size sofa sleeper, Fully equipped kitchen, Maximum Occupancy 6 guests. COMPLIMENTARY BEACH CHAIRS AND UMBRELLA SERVICE IN SEASON!!!! Maravilla is a 33.7 acre community of prime Destin gulf front property on Old Scenic Highway 98 in Destin, Florida. You will love the 2.5 acre private sugar white sand beach at Maravilla Resort. More amenities include: two luxurious swimming pools, whirlpool Jacuzzi, tennis courts, shuffleboard, and clubhouse with exercise room and equipment. BEACH SERVICE IS PROVIDED COMPLIMENTS OF THE OWNERS!!!! Please note the aerial photo that shows a design of the Maravilla Resort complex. Buiding 2 directly faces the beach and the ocean. Our unit, 'Elizabeth Claire,' suite 2302, is located in Building 2. It is on the third floor, close to the elevator, with direct views of the ocean! HELLO, FLORIDA SUNSHINE! KEEP ON SHINING! 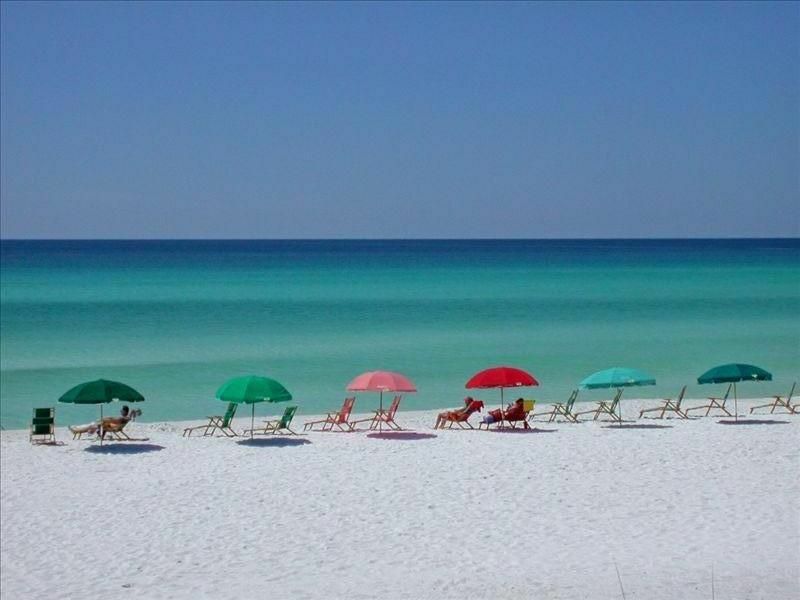 It's time for families to relax and enjoy a beach vacation in Destin, Florida! SO WHAT TIME IS IT? Time to head to the beach! Time to take the kiddies and the cooler and head for DESTIN, FLORIDA! Please call Mara Lee to make a reservation at the Elizabeth Calire Condo, suite 2302, in Maravilla Resort. Life is SWEET at the Elizabeth Claire Condo, suite 2302! RENTAL POLICIES: We are family oriented and will not rent to vacationing students or young adult under the age of 25. A reservation/security deposit of $200 is required and due upon booking a reservation. In addition to the rate, a $60 processing fee and a $150 exit cleaning fee are added to the invoice. FL tax is 11.5%. No refund of rent for late arrival or early departure. An advance payment of 50% of the rental invoice is due upon booking a reservation payable by a credit card.The balance of the rental invoice is due 30 days prior to arrival. Reservation/security deposit will be refunded by check within 14 days of departure providing there is no smoking, no pets, no damage or no theft and maximum occupancy limit is respected. Please refer to Rental Policies for more additional information on rental policies. Cancellation: PLEASE consider Travel Protection Insurance to avoid some of the risks associated with a cancellation. No refund of rent due to cancellation, late arrival or early departure. Optional Travel and Rental Protection available via Royal Adventure Travel Protection. Spring break and summer season require weekly rentals. Off season requires 4 night minimum. BEAUTIFUL 2.5 acres private beach at Maravilla Resort, Two swimming pools (1 heated), Tennis Courts, Whirlpool Jacuzzi near Clubhouse. Exercise equipment at Clubhouse, BBQ Grills, Cable TVs, & DVDs. High speed Internet. No smoking, No Pets, No Damage, No theft, Must be 25 years old to rent. and More Golf! Destin's Famous Harbor & Fishing Fleet, Deep Sea and Fly Fishing, World Class Restaurants and Casual Dining, Water Sports, Water Parks, Henderson State Beach Park, James Lee Beach Park, SHOPPING & MORE!